Our range of products include twin lobe blowers, tri lobe blowers, ring blower and radial blower. 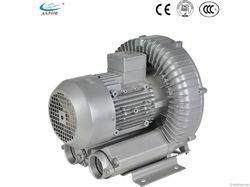 Twin lobe rotary air blowers belong to the category of positive displacement blowers. They consist of a pair of involute profiled (shape of 8) lobes/rotors rotating inside an oval shaped casing, closed at ends by side plates. One lobe is the driving lobe, which is driven by the external power, while the driven lobe is driven by a pair of equal ratio gears. Both lobes rotate at same speed but in opposite directions. As the rotors rotate, air is drawn into inlet side of the cylinder and forced out of the outlet side against the system pressure. With each revolution, four such volumes are displaced. The air, which is forced out, is not allowed to come back due to the small internal clearance within the internals of the machine, except a very small amount (SLIP). There is no change in the volume of the air within the machine, but it merely displaces the air from the suction end to the discharge end, against the discharge system resistance i.e., no compression takes place in the machine. Since the lobes run within the casing with finite clearances, no internal lubrication is required. The air, thus, delivered is 100 per cent oil free. These blowers deliver, practically, a constant flow rate independent of the discharge pressure conditions. The flow rate is dependent, largely on the operating speed. Flow largely depends on operating speed. The input power is largely dependent on the total pressure across the machine. The suction and discharge pressures are determined by the system conditions. The temperature rise of the discharge air and machine largely depends on the ƒ¢p across it. Gardner Denver is shaping the standards of performance and reliability in the design of positive displacement blowers and vacuum pumps. The tradition continues with the TriFlow Series vacuum pumps. Each TriFlow is engineered for a wide range of commercial and industrial applications. Specifically, TriFlow is the choice of leading Original Equipment Manufacturers (OEMs) of truck mounted vacuum cleaning systems. An internal feedback porting arrangement contributes to the further reduction of noise. Every TriFlow vacuum pump is built under rigid ISO 9001:2000 quality standards. Each TriFlow is individually tested to meet rigorous performance specifications. 12 months from the date of installation, whichever occurs first. Integral heat dissipation fins on the case to help maintain proper clearances. Piston ring seals are incorporated on each impeller shaft with a lip seal on the drive shaft, providing superior sealing to prevent oil leakage into the air chamber. Independent oil sumps prevent cross contamination and allow the vacuum pump to operate safely on an incline when used in carpet cleaning applications. Unique, integral mounting surfaces are precision machined for ease of installation and drive system alignment. Critical mounting dimensions are similar to those of existing two lobe positive displacement vacuum pumps allowing for system upgrades. The inlet and outlet ports include both flange and FNPT connections for ease of plumbing. 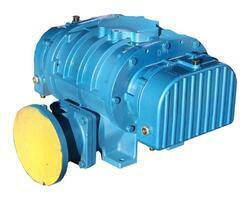 Ring Blowers are designed for the conveying of air as well as for generating pressure or vacuum. Industrial Ring Blowers are known by many different names across the world. They are also referred to as Regenerative Blower, Side Channel Blower, Turbine Blower, Ring Compressor, Industrial Vacuum Blowers, Vortex Blower etc. Industrial Ring blowers are manufactured for both pressure and vacuum service. When a ring blower is used for pressure, it is usually configured for use as air supply units or compressors, while vacuum blowers are frequently used as vacuum pumps or fume/dust exhausters. All regenerative ring blowers consist of an impeller that spins within a housing. This housing contains both an intake channel and an outboard channel; hence the name side channel blowers. When the impeller moves past the intake port, air is drawn in and trapped between the impeller blades. As the impeller continues to turn, the air is pushed both inward and outward through both channels, and this process continues until the impeller stops rotating. It is this regenerative process that allows the side channel blower to function as both a pressure blower and a vacuum blower. While the air trapped between two impeller blades represents only a small pressure increase, the sum total of the blades, from intake to outlet, is capable of powerful continuous operating pressures. 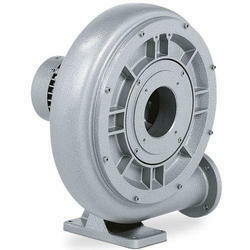 We are indulged in offering the finest quality Radial Blower. Looking for Industrial Blower ?